Creating new added value centered on the edge computing layer. In the manufacturing industry, IoT adaptation is accelerated to enhance competitiveness and create new value. 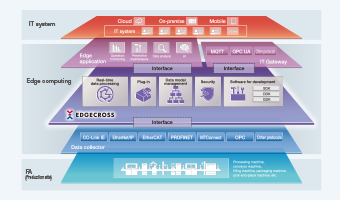 Following the trend, Edgecross Consortium aims to create new added value based on the edge computing layer beyond the borders of companies and industries, contributing to IoT adoption in the manufacturing industry.